This day a year ago, The Archive became publicly available for sale! To celebrate, we chopped 50% off of the regular price for 5 days. 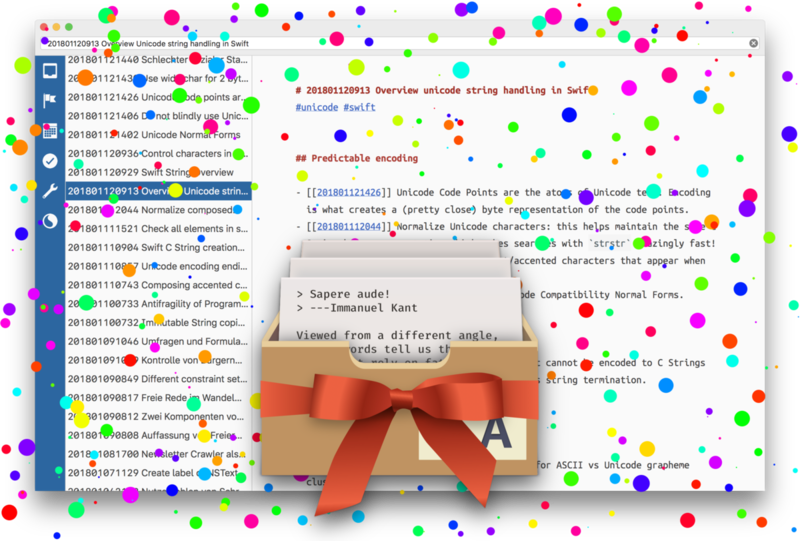 You can now also purchase a license for a friend, colleague, family member, or your favorite pet by using the new Gift Purchase option in our store. The sale is over! Thank you all very much for the amazing year! Dr. Christopher Foley is a piano teacher based in Toronto, Canada. 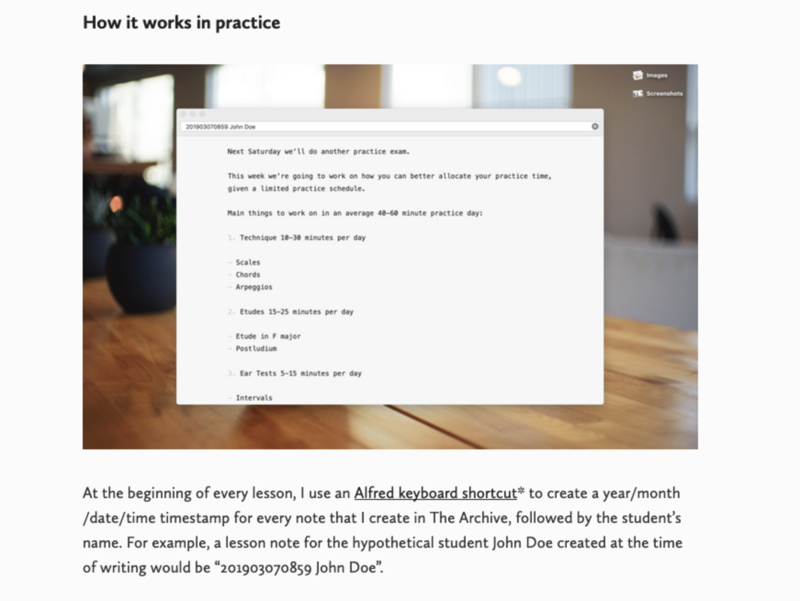 He set up The Archive to write, send, and curate lesson notes for his piano students. Read “How I Use The Archive and My Music Staff to Create Engaging Lesson Notes”. Christian’s Comment: I’m familiar with programming and the humanities, but I always wondered how a Zettelkasten could work for fine arts – or music, for that matter. I’m looking forward to hear progress reports by Dr. Foley that go into detail! Jai of The Appademic wrote a blog post about The Archive and the Zettelkasten Method in combination, how The Archive superseded nvALT for him, and how he found the Zettelkasten Method to go with minimalism and portability of data. In the nearby town of Paderborn, there’s a community-organized meetup called “MacMittwoch” (literal translation: “MacWednesday” – guess when they meet :)). These fine folks produce a podcast, too, and their Farid Mésbahi and Gordon Möller visited Sascha and me in Bielefeld for a very nice chat. The result is Episode 15: Der Zettelkasten. We talked about The Archive, but even more did we talk about the Zettelkasten Method in general, about emerging structure versus folder management, and why we value software agnosticism above all. Farid and Gordon are very welcoming and curious hosts, and Sascha and I are pleasant to the ear as always, of course, so you will want to listen to this episode (1h 8min; German only).